Three of the biggest US banks reported strong profits on Friday, helping to lift US share markets. The gains at JP Morgan Chase, Citigroup and Wells Fargo came despite concerns about rising interest rates and the impact of trade tariffs on business expenses and global growth. JP Morgan Chase boss, Jamie Dimon, said issues such as Brexit, trade tensions and rising interest rates pose risks. But economic data, especially in the US, has remained healthy, he said. "So far, we still have a strong economy in spite of these increasing overseas geopolitical issues bursting all over the place," he said on a conference call after the earnings release. 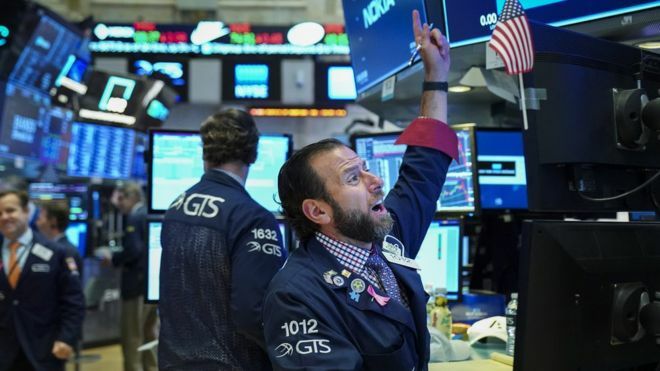 The comments, combined with earnings results, appeared to help soothe markets, which had suffered steep declines in recent days. The Dow Jones Industrial Average and S&P 500 both gained more than 1% in morning trade, while the Nasdaq leapt 2.2%.